7 Strands Braided Wire, 6FT. #14 Galvanized Wire, 100FT. #18 Copper Wire, 25FT. 7 Strands Braided Wire, 8FT. #16 Galvanized Wire, 200FT. #20 Copper Wire, 12FT. 7 Strands Braided Wire, 10FT. #18 Galvanized Wire, 50FT. #24 Copper Wire, 25FT. 7 Strands Braided Wire, 12FT. #18 Galvanized Wire, 80FT. #24 Copper Wire, 100FT. 7 Strands Braided Wire, 15FT. #18 Galvanized Wire, 100FT. #18 Aluminum Wire, 50FT. 7 Strands Braided Wire, 20FT. #18 Galvanized Wire, 110FT. #22 Aluminum Wire, 25FT. 12 Strands Braided Wire, 15FT. #19 Galvanized Wire, 50FT. #28 Brass Wire, 75FT. 12 Strands Braided Wire, 25FT. #20 Galvanized Wire, 20FT. #19 Stainless Steel Wire, 30FT. 15 Strands Braided Wire, 25FT. #20 Galvanized Wire, 25FT. 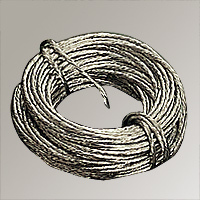 #19 Annealed Wire, 50FT. 16 Strands Braided Wire, 6FT. #20 Galvanized Wire, 150FT. #22 Annealed Wire, 75FT. 16 Strands Braided Wire, 15FT. #20 Galvanized Wire, 175FT. #24 Annealed Wire, 100FT. 16 Strands Braided Wire, 25FT. #22 Galvanized Wire, 100FT. 20 Strands Braided Wire, 15FT. #24 Galvanized Wire, 25FT.